We had just the best vacation in London. And we took lots and lots of pictures. I've got some recaps coming up, and we've got our garden coming along... but for today, I just wanted to share some beautiful daffodils. 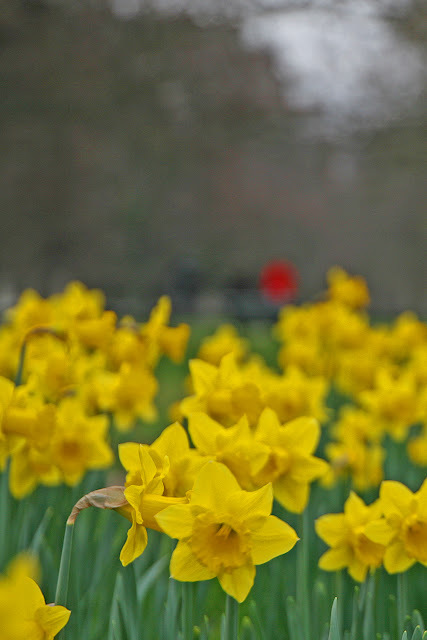 Doesn't a daffodil just feel like Spring? Spring is hope and renewal, a welcome sight after a long winter. The rest of these are all straight out of the camera. This is the original of the photo above. I cropped and changed some of the light and saturation to get the effect above. I wanted to get a bit of a watercolor look, and I liked the bit of red. This is one of my favorites - I like a single (well in this case, two) flower in focus and a field of flowers in the background.